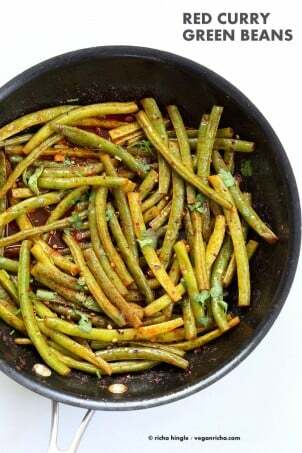 I have always loved the green beans with the hot phrik khing sauce from Thai restaurants. So I decided to make some myself. The traditional version uses a prik khing curry paste. Red curry paste is a close match and the flavors work out beautifully, and I also generally have red curry paste in my pantry. 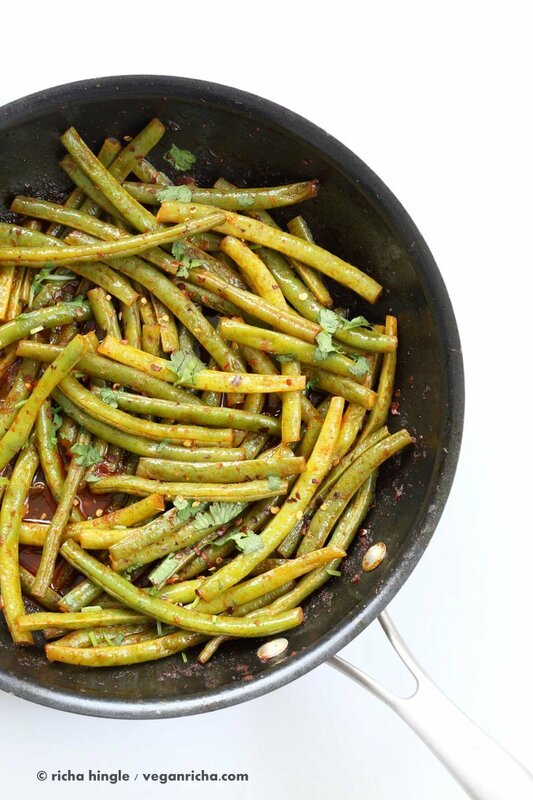 These red curry green beans are easy and come together really quickly. Toss in some garlic, curry paste, kaffir lime leaves or lime zest, heat and let them cook until tender to preference. 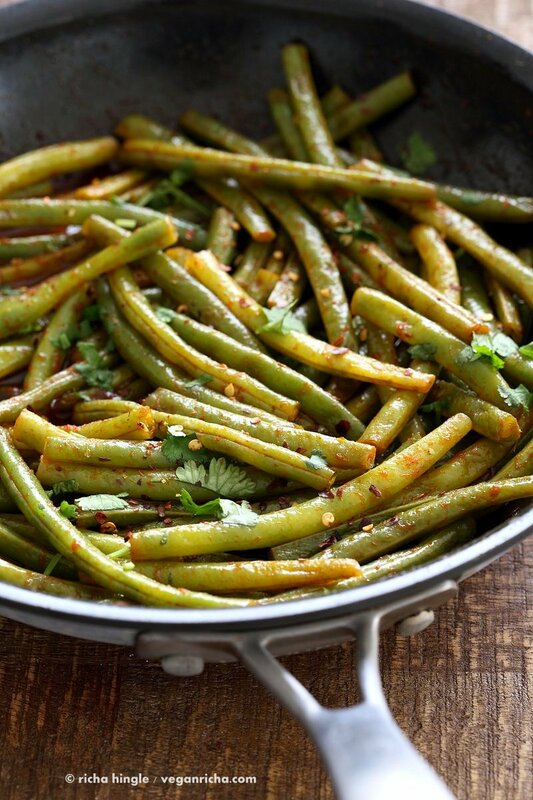 The cook time for green beans depends on the type of beans. The thinner beans cook faster, so cook until they are slightly crunchy but done. Add more curry paste and water/broth for saucier beans to serve over plain rice if needed. Add some baked or crisped tofu for variation. Serve with Peanut Sauce Fried Rice or other vegetable fried rice. Green Bean Carrot Poriyal. Green bean carrot stir fry with spices and coconut. Red Curry Green Beans, Served here with Peanut Sauce Fried Rice. Bring a large pot of water to a boil. Blanch the green beans for 2 minutes, drain and keep aside. If using thinner beans like haricot verts, blanch for 1 minute. Heat oil in a large skillet over medium low heat. Add garlic and cook until translucent. 2 minutes. Add the red curry paste and mix and cook until fragrant . 1 minute. Add the soy sauce, lemon, lime leaves or zest, water, sugar, cayenne and salt and mix well. Increase heat to medium. Cook for a minute. Add the green beans. toss to coat. Cover and cook for 3 to 6 minutes or until tender to preference. Taste and adjust salt, sweet, and spice. I added some red pepper flakes as the curry paste I use is not hot. Serve hot with rice or noodles or cooked grains of choice. The beans can also be garnished with crushed peanuts or almonds and cilantro. To make this a meal, add some crisped or baked tofu when you add the beans. YUM, now I want some! These look super spicy and delicious! Looks so tasty. And thanks for the reminder about your fried rice. My family devours that each time I make it! Your green beans and fried rice sound like a great combo. Thats awesome that you all love the fried rice! This is yummy. I doubled the sauce in order to wet the noodles I served it over. I used Thai house red curry and the recipe amount of cayenne and it was perfect heat for me. Next time,yes I’m making this a lot, I will cut back on the sugar. One more tip. I blanched more green beans than I needed because I eat them for a snack right out of the fridge. Awesome! sure, adjust the sweet to preference. Looks so yummy! Can’t wait to try the recipe! Can you share brand name of your favorite store-bought vegan Thai Red Curry Paste. Thanks! I use thai kitchen brand. it does not contain fish sauce. Great and quick recipe, crunchy tofu goes very well with the sauce. We made this last night using a variety of vegetables & lentils and used 1/2 the sugar – it was fantastic! Thank you for this recipe!! I just made this tonight and it was fantastic! Thanks for the recipe. I added some baked tofu and served it over some rice noodles. Yum. It really tasted like the Prik King I’ve had at Thai restaurants.